The Sonata is one of those buildings that require a little extra processing when I collect District sales records. Although the property's official street address is 301 Massachusetts Ave NW, the District's property records list its address as 301 303 H St NW. As this fellow said, "they've somehow wormed their way to a Massachusetts Ave address." 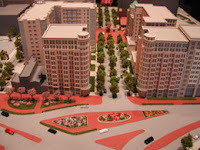 ...part of the Mount Vernon Place mixed-use development, is one of two towers that will create a dramatic gateway to Mount Vernon Place from Massachusetts Avenue. The 12-story building features 75 condo units with loft-style design and includes eight penthouses. Prices started in the $300s. Mount Vernon Place, being developed by Quadrangle Development and The Wilkes Company, is a mixed-use development located in the Mount Vernon Triangle and consists of one million sq. ft. of commercial and one million sq. ft. of residential development. The other tower mentioned above is Madrigal Lofts. 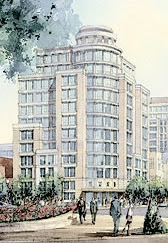 In fact, the Sonata is the first of 11 buildings in the Mount Vernon Place development. The developers envision the Sonata and a future condo building to be the "Massachusetts Avenue Gateway" to Mount Vernon Place. Or maybe it's the other way around? 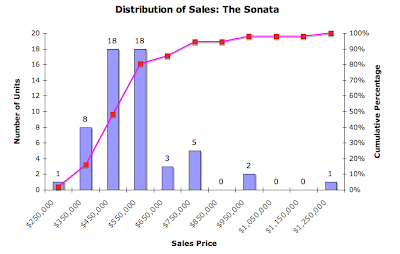 Apparently, the Sonata sold out within two months of launching pre-construction sales in February 2005, but the District's real property assessment database shows that 20 units are either unsold or have not had their deeds recorded yet, so I assume a few deals fell through. 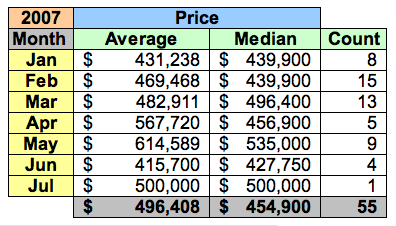 The table below details the average and median prices and sales volume for each month's transactions. Actually, the District has recorded 56 transactions at the Sonata this year. One unit, #903, has been flipped, but I'm excluding it from the analysis because the recorded sales price of the second sale makes no sense and the District's Recorder of Deed's records offer no clarification. The unit was purchased in February for $727,100 and resold in May. However, the District recorded the second sale's price as $163,000, which I have to believe is an error. Of the 20 units that are available, three are on the 11th floor, units #1102-1104. Unit #1103 [MLS DC6318679], a 2/2 with 1266 sq ft and a $871/month condo fee, is available for $825,000, or $652/sq ft. One floor higher, unit #1203 [MLS DC6318693], a 2/2 with 1361 sq ft and a $871/month condo fee, is available for $835,000, or $614/sq ft. This unit, on the seventh floor, had been advertised for rent one week earlier for $2900. The sales prices are from 2005 but only get recorded when the unit is delivered. Having a median/mean just tells us how much the units were going for back in 2005, when the owners locked their prices in. While the price may have been set in 2005, it's now a 2007 recorded value that will be used as a comp for anyone trying to buy or sell a unit in the building, if not the neighborhood. They have had a banner on the building since completion that says "Immediate Delivery"
I notice 1010 Mass, which I believe is beginning closings, or, in their jargon, "delivery", this month has a similar banner posted.